Intel Corp.’s NUC [next unit of computing] small form-factor PCs offer decent performance and are rather small. Unfortunately, such systems come with limited choice of processors and cannot be upgraded. By contrast, mini-ITX systems support all types of CPUs, can be upgraded, but are considerably larger. In a bid to offer small dimensions and a choice of CPUs, Intel proposes a new mini PC form-factor: 5×5. Intel’s 5×5 is an all new form-factor for upgradable personal computers that has around 0.85 liters volume and around 39mm height. The core component of the 5×5 platform is a new mainboard with 140mm*147mm (5.5”×5.8”) dimensions, around 30 per cent smaller than mini-ITX, but considerably larger compared to motherboards inside NUCs. The mainboard has an LGA socket, two SO-DIMM slots, an M.2 connector for solid-state drives, a port to plug Wi-Fi/Bluetooth card, a SATA port, two USB 3.0 connectors, two HDMI outputs, Gigabit Ethernet and so on. According to Intel, 5×5 mainboards will support all processors with 35W and 65W thermal design power, which gives a broad choice of components to system integrators or end-users. 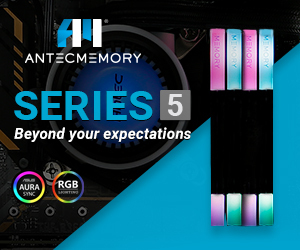 Unfortunately, the Intel 5×5 platform does not support any PCIe x16 slots for graphics cards, unlike mini-ITX, which will prevent gamers from adopting such systems. The newly-announced Intel 5×5 form-factor will require new PC chassis and new CPU coolers. However, it will provide PC makers and DIY end-users with a lot of flexibility in terms of possible configurations, something that NUC simply does not offer. 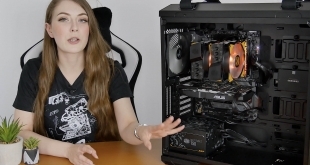 It is unlikely that a lot of people upgrade SFF PCs in general, but an ability to install different processors is an important feature. 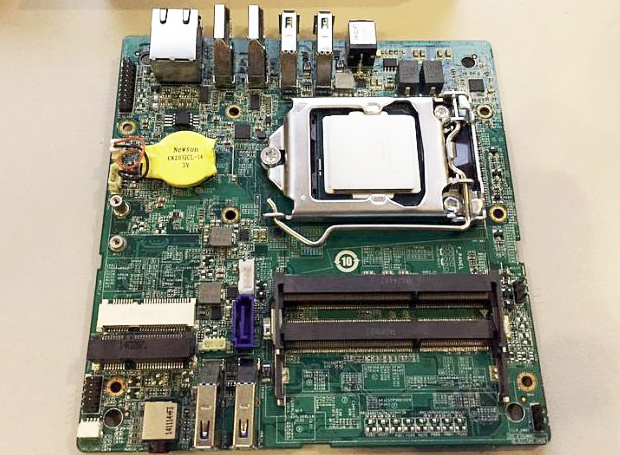 At the Intel Developer Forum 2015 the chip designer demonstrated a prototype of a 5×5 mainboard equipped with an LGA1150 socket for “Haswell” and “Broadwell” processors. 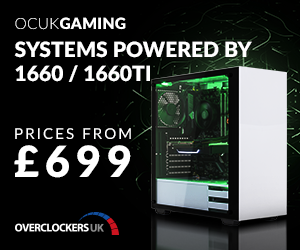 Commercial systems will likely feature LGA1151 sockets for higher-performing “Skylake” central processing units. Moreover, Intel might consider adding its “Alpine Ridge” controller to the design in order to enable USB 3.1 type-C and Thunderbolt connectivity. Such port could allow addition of ultra-fast solid-state drives and external graphics solutions, something that gamers and creative professionals will appreciate. Intel 5×5 prototype mainboard. Image by hardware.hdblog.it. 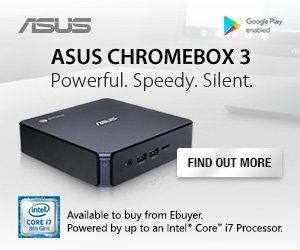 Intel does not reveal when the first 5×5 systems are set to hit the market, but it is possible that the first PCs adopting the new form-factor will become available already next year if Intel starts to produce 5×5 mainboards itself or persuades makers of motherboards to make such products. KitGuru Says: Intel’s 5×5 form-factor sits between mini-ITX and NUC. It is not as flexible as the former and is not as small as the latter. The only tangible benefit that the 5×5 has over NUCs is a wide choice of microprocessors, which is good, but is it enough for the industry to embrace a new standard? 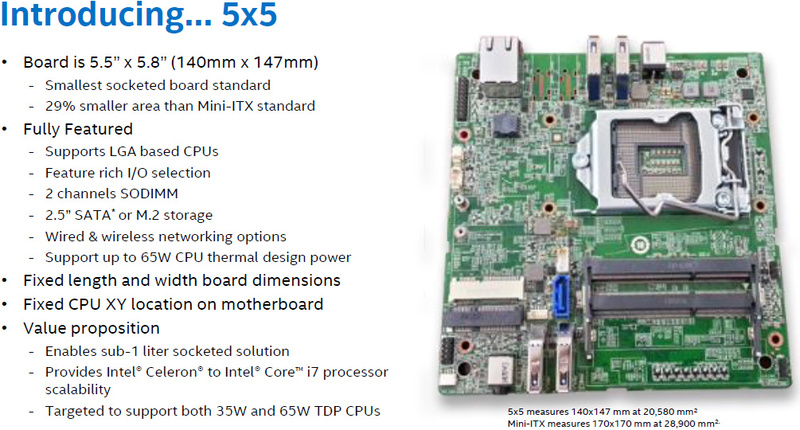 The new 5×5 platform makes a great sense from Intel’s business point of view. 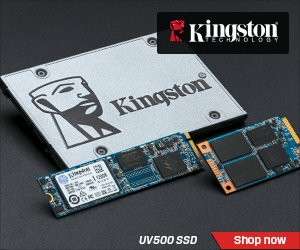 The amount of Intel’s content per one 5×5 box can be extremely high (an expensive LGA CPU with high-performance integrated graphics, an SSD, network and USB controllers [should Intel decide to integrate “Alpine Ridge”], etc.). Furthermore, inability to upgrade graphics sub-system will force consumers who demand better performance in video games to switch the entire box instead of just graphics adapter, which shrinks upgrade cycles. But will the industry bite? Only time will tell.